Do you love your mother/guardian? Do want to treat her to a Mother’s Day breakfast but don’t want to cook or wait an hour and a half in line? Well, do we have a deal for you? 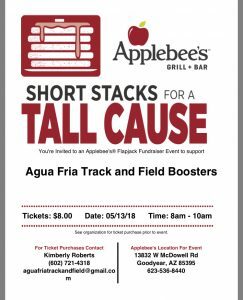 This Sunday, the Agua Fria Track and Field Team is hosting an unlimited pancake fundraiser. For the price of $8 per person, you can join us for unlimited pancakes. Not only do you get to treat your dearest mother you also get to help you Track and Field Team. You can purchase your ticket from any track and field athlete, Coach Espinoza in room C3 or at the door. See flyer for details. Do it for your mother, she deserves it.